It was the hard rocking sound of hits like Still Of The Night and Give Me All Your Love Tonight that brought Whitesnake worldwide, multi-platinum success. Even so, the band’s founder and lead singer, David Coverdale has never been a stranger to the occasional ballad, going back to his early days with Deep Purple on Soldier Of Fortune and, most famously, with Whitesnake on the 1987 #1 smash hit, Here I Go Again. After Whitesnake finishes its current summer tour with Foreigner, the band will revisit some of its best acoustic performances with Unzipped: Super Deluxe Edition. This five CD/DVD collection brings together unplugged and acoustic-based performances recorded over the past 20+ years, including rare and unreleased studio and live recordings, acoustic demos, concert videos, interviews and more. The extensive set will be available on October 19 for $59.98. On the same day, Rhino will also release UNZIPPED in three other formats: single-CD ($7.98), double-CD ($19.98), and double-LP ($29.98). All of the music will be available digitally and via streaming services. The first disc from Unzipped: Super Deluxe Edition mixes rare and unreleased versions of songs like Summer Rain and Forevermore from the band’s recent studio albums, Good To Be Bad (2008) and Forevermore (2011). Also included are songs like Love Is Blind from Coverdale’s solo album, Into The Light (2000); and a previously unreleased song, All The Time In The World. All 11 tracks are available on the single-CD, double-CD and double-LP versions of Unzipped. In 1997, Coverdale and guitarist Adrian Vandenberg played an unplugged concert in Tokyo that was recorded and initially released exclusively in Japan as Starkers in Tokyo. That recording has been remixed and will make its North American-debut on the second disc of Unzipped: Super Deluxe Edition. The acoustic performance touches on the different stages of Coverdale’s career, from his time in Deep Purple (Soldier of Fortune), to his solo albums (Too Many Tears), and, most famously, with Whitesnake on unplugged versions of hits like Is This Love and Here I Go Again. These 12 tracks, along with all the music on the single-CD version of Unzipped, will also be available on double-CD, and double-LP. 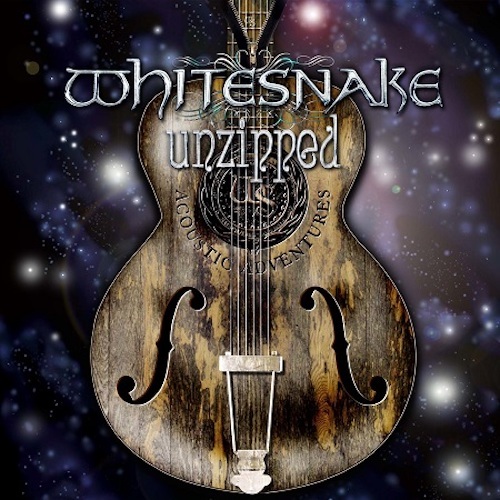 Unzipped: Super Deluxe Edition has even more of unreleased, unplugged recordings, including more performances from Coverdale’s 1997 tour with Vandenberg, plus several later shows featuring Coverdale and guitarist Doug Aldrich. Plus, more than two dozen of Coverdale’s unreleased, acoustic demos are also included in the collection. A DVD completes Unzipped: Super Deluxe Edition with live, unplugged performances filmed around the world between 1997 and 2015, including a complete acoustic show recorded at the Cutting Room in New York in 2008. A highlight for U.S. fans will be the North American debut of the 1997 concert video, Starkers In Tokyo, which has been remixed in 5.1 and Stereo exclusively for this new collection. Additional bonus features include an interview with Coverdale and Vandenberg, bootleg videos, the Love Is Blind music video and a slideshow. Whitesnake is currently on tour. More info on tour dates can be found at whitesnake.com/tour. I really like his live version of “Ain’t No Love In The Heart Of The City”. Doug Aldrich’s blistering guitar work and sound on the live album was impressive. Ozzy, Coverdale and Rob Zombie seem to always find the most amazing guitarists/musicians.